8 (d) 15% from complex carbohydrates, 15% from sugars or simple carbohydrates. 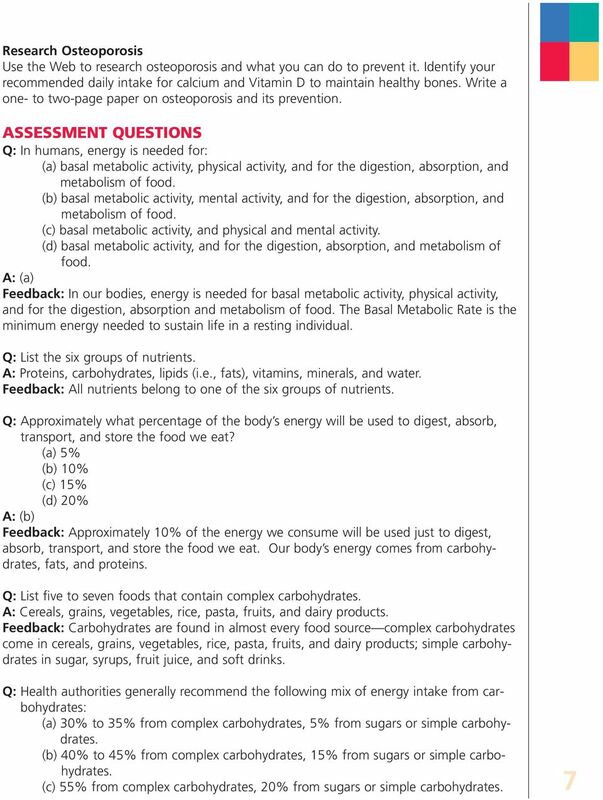 A: (b) Feedback: Health authorities generally recommend that 40% to 45% of our energy intake come from complex carbohydrates, with only 15% coming from sugars, or simple carbohydrates. In total, about 55% of our energy intake should come from carbohydrates, and the balance from fats and protein. Q: Excess energy consumed by humans is converted and stored as. 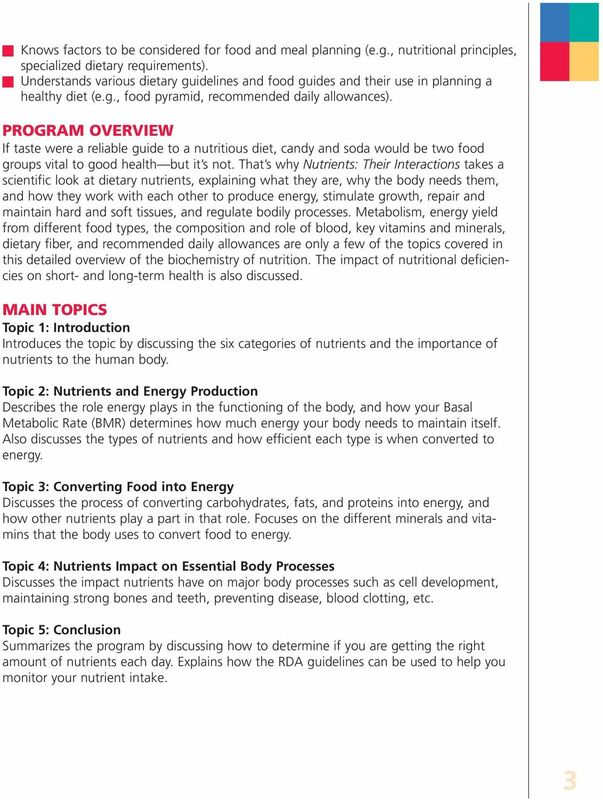 A: body fat Feedback: Energy the body doesn t need gets converted and stored as body fat. Too much body fat can lead to significant health problems. Q: The higher a person s, the greater their energy requirements. A: metabolic rate Feedback: The mineral iodine is an essential part of the hormone thyroxine, which regulates the body s metabolic rate. The higher the metabolic rate, the greater a person s energy requirements. Q: During digestion, protein is broken down into a variety of. (a) amino acids (b) nutrients (c) cells (d) soft tissue A: (a) Feedback: During digestion, protein is broken down into a variety of amino acids. 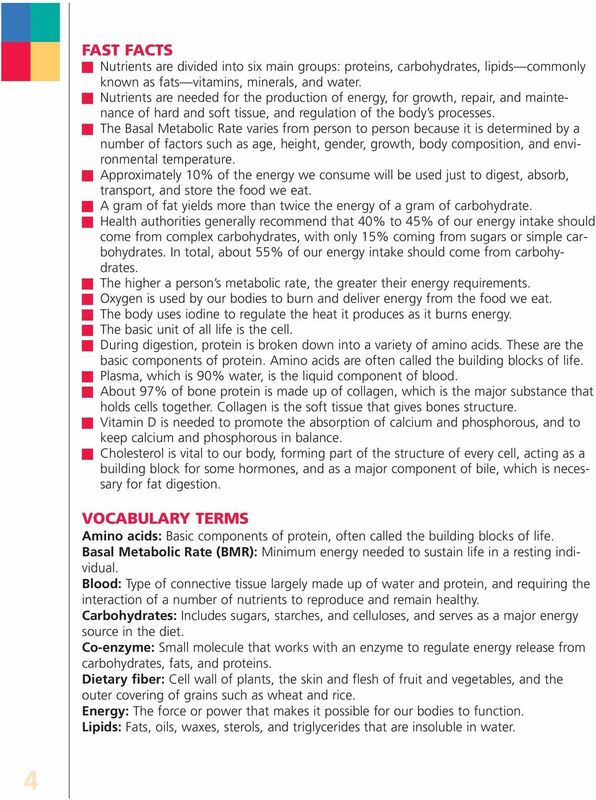 These are the basic components of protein. In fact, amino acids are often called the building blocks of life. Q: List three of the six items required to make healthy blood cells. 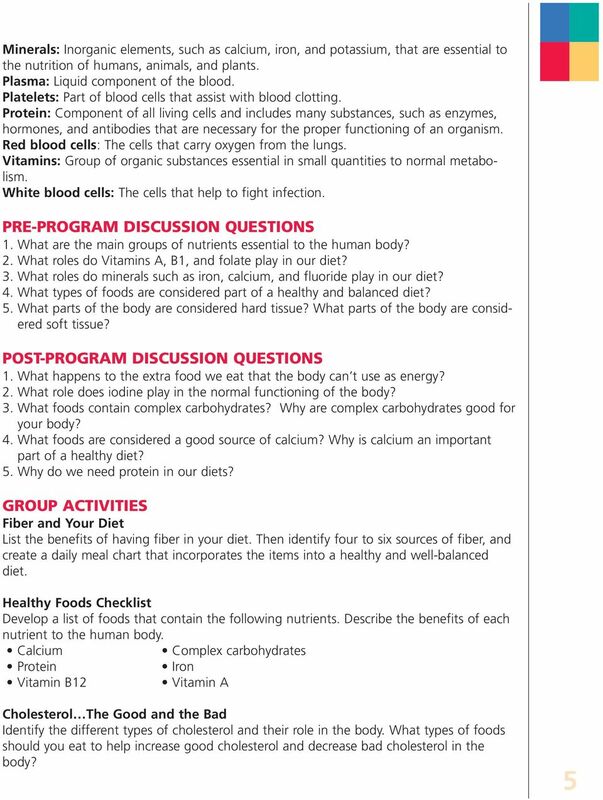 A: Protein, water, iron, folate, Vitamin B12, and Vitamin C Feedback: To make healthy red blood cells requires protein, water, iron, folate, Vitamin B12, and Vitamin C. Folate and B12 are needed to make DNA (the genetic material of the cell) and to ensure the proper formation of red blood cells. Without sufficient folate and B12, red blood cells may not develop properly, and this will interfere with their capacity to carry oxygen. Vitamin C assists in the absorption of the iron necessary to make hemoglobin, the vital protein in red blood cells which carries the oxygen. 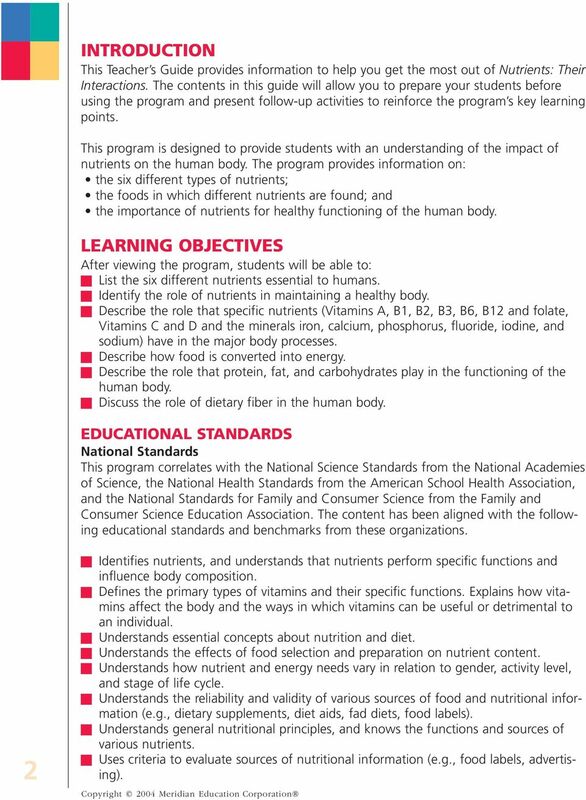 8 Q: Proteins make up approximately % of all our bodies cells. 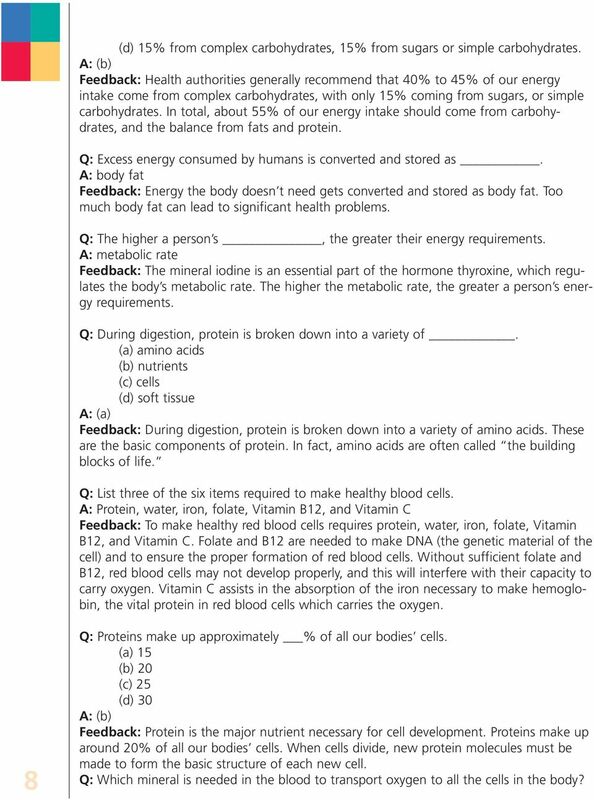 (a) 15 (b) 20 (c) 25 (d) 30 A: (b) Feedback: Protein is the major nutrient necessary for cell development. Proteins make up around 20% of all our bodies cells. When cells divide, new protein molecules must be made to form the basic structure of each new cell. 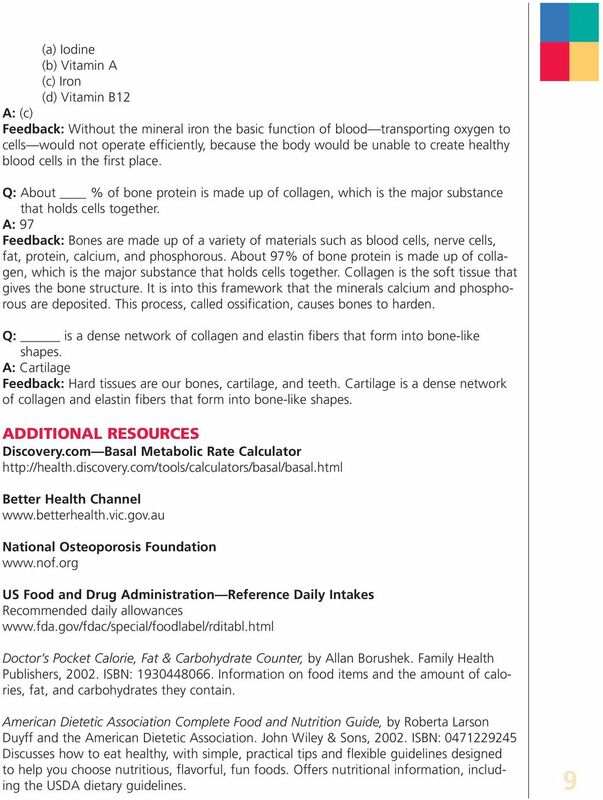 Q: Which mineral is needed in the blood to transport oxygen to all the cells in the body? 1. (U4C1L4:G9) T or F: The human body is composed of 60 to 70 percent water. 2. 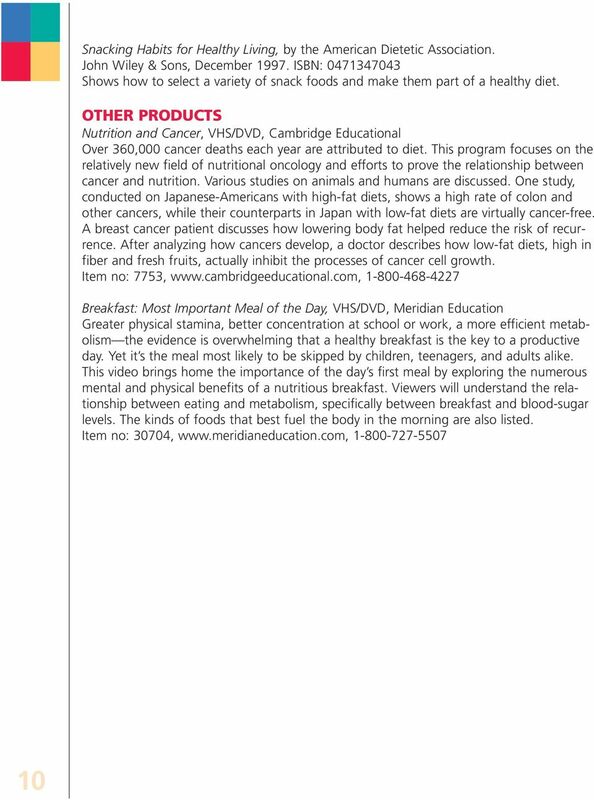 (U4C1L4:G13) Another name for fiber in a diet is. Can You Be Vegan/Vegetarian after Bariatric Surgery? top 5 fat burning tips by steve dennis top 5 fat burning tips by steve dennis Are you frustrated about trying to lose body fat? Confused about what foods to eat? Do you often wonder why carbs are bad? Overview. Nutritional Aspects of Primary Biliary Cirrhosis. 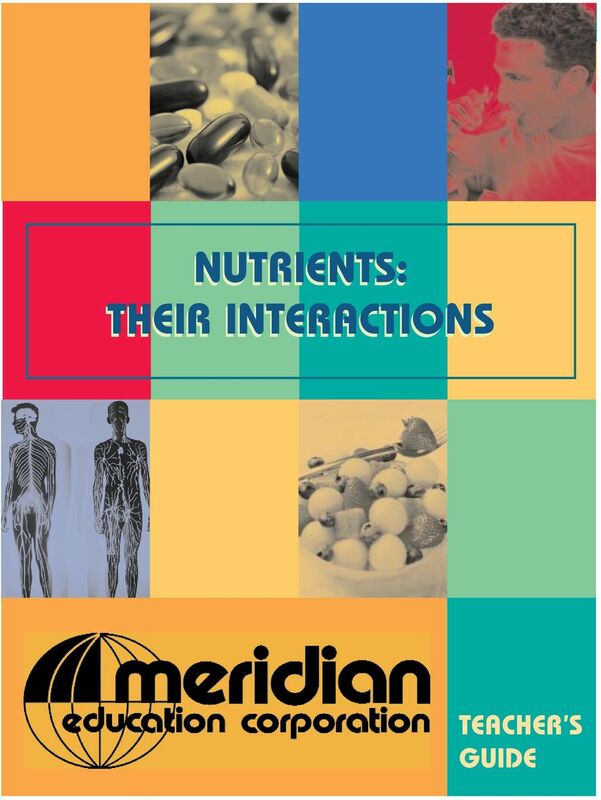 How does the liver affect nutritional status? CHILD CARE DIPLOMA Course Sample Unit CHP2 Providing for children s physical needs inclusive of health and safety The Statutory framework for the EYFS is a requirement for all registered early years providers. Here's how to include more fiber in your diet. Lab 6. 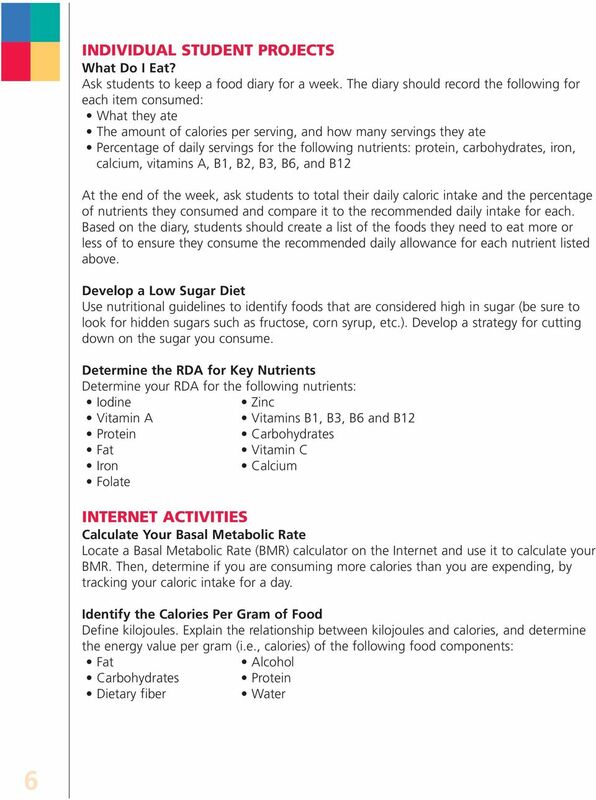 Diet Analysis: Are you eating right?